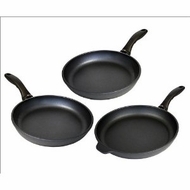 This 3 piece frypan set contains an 8,10,and 11 inch open frypans. A great collection of frypans that provide great flexibility for all sorts of cooking projects. The pans feature a patented diamond reinforced non stick cooking surface using real diamond crystals in a nano composite. This new non stick cooking surface makes for unequal food release and easy effortless cleanup plus, will not peel, crack or blister.